Generac Mobile products has supplied its market leading Dust Fighter range to the high-profile rail platform upgrade at Waterloo this summer and due to performance has also been added to the preferred product listing by Skanska for future rail and infrastructure upgrades. Working in partnership with Skanska, who through an Alliance of companies (AECOM, Colas Rail, Mott MacDonald & Network Rail) were awarded the contract for the design and improvements works to complete a package of complex upgrade works at Waterloo Station and along the Wessex route., The Alliance selected a number of short to long dust fighter units including the market leading MPT 7500 with 2000 litre tank and 22kVA generator. 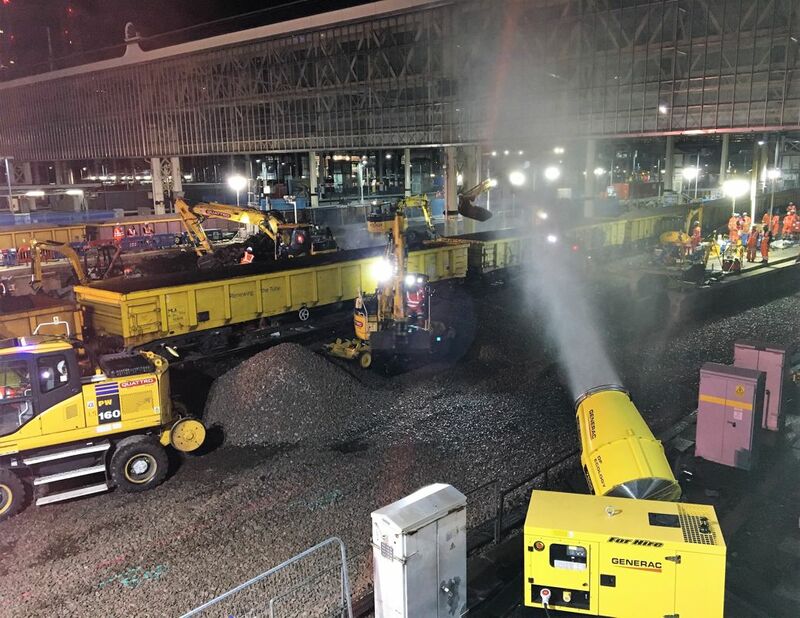 The Dust Fighter Range from Generac Mobile® was chosen for its versatility and breadth of application which was a pre-requisite to supply and support the upgrade at Waterloo. A key Health &Safety requirement, the dust fighter units were deployed to control, cover and reduce dust contamination into neighbouring platforms, operational train routes and passenger terminals. The innovative and robust DF 7500 Mobile Power Tank (MPT) was selected to dampen down dust particles as ballasts were being loaded and unloaded into the freight wagons and cover an area of up to 40m. The DF 7500 MPT is an ‘all-in-one solution’ since it equips a DF 7500 dust control unit combined with a 2000 litre stainless steel water tank and to a 20kW power generator. It is a completely independent machine usable in every kind of circumstance, even in remote areas, and ideal for under and over ground rail projects. Neighbouring platforms were supported by the compact DF Mini units which were placed close to active platforms to avoid contamination and improve the general environment for passengers and operational trains. These are ideal units for indoor use due to the small upright positioning and 70 litre tank capacity. For residents, offices and buildings close to the station, dust particles were dampened and controlled by the DF Smart range to reduce dust particles in the atmosphere and provided coverage of up to 13m. 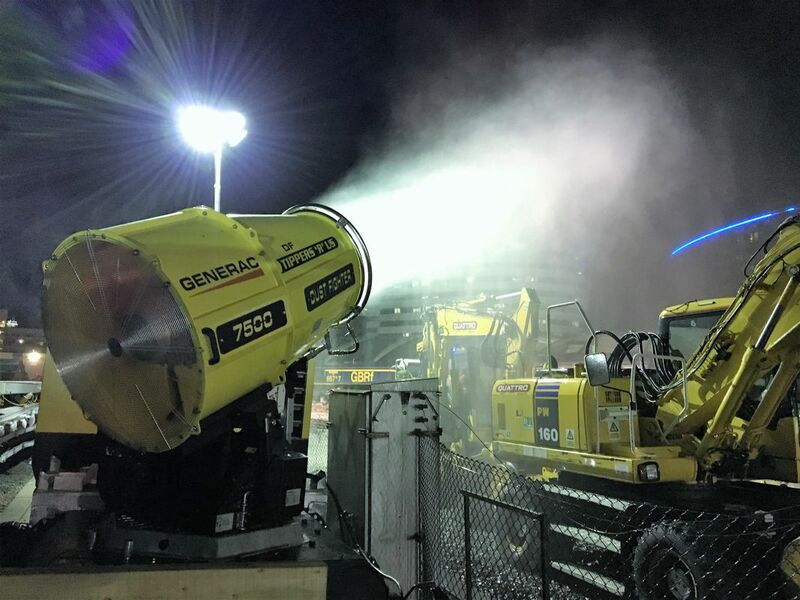 Unlike traditional dust suppression systems, the Generac dust control units provide operators with a range of options based on the performances and the size of the area which require coverage by the nebulized water. The nebulized water used in the units is essential to capture and easily combine with dust particles to drag them to the ground. Such a system is more effective and sustainable, as the dust can be suppressed quicker, reducing water consumption and preventing muddy work areas created by pools of water from traditional methods. Beat Nowrooz, Area Sales Manager said: “To support this scale of project it was essential to combine product efficiency with onsite practicality. “Unlike traditional methods of dust suppression such as a water hose, which require one man to operate the unit until the dust has settled, our products are automatic and can be controlled remotely therefore making it easier for onsite teams to manage. The planned upgrades at Waterloo are part of a long-term project focused on modifications at the station and improvements to the outlying stations and rail systems which could see capacity increased for up to 45,000 passengers at Waterloo and new, longer rolling stock trains operate across routes in the South West. The dust suppression systems of Generac Mobile® are suitable for a variety of applications, such as demolition works, mining sites, odour suppression in waste dumps, aggregate production or recycling, environmental repairs and much more. The smallest units, DF Mini and DF Mini Duo, are also ideal for asbestos removal and can be used for indoor works.